What is this wadded, folded red object? Why is it all folded up? Because now that I’m in the post sleeve cap arm section, I am knitting both sleeves at the same time, using the two-circ method. This will guarantee that they are both the same length and configuration. I often do the same thing for socks, mittens, or other things that come in identical or mirrored pairs. I even knit cardigan fronts side by side when working flat, for the same reason. You can barely see a pink stitch marker attaching the two sleeves together in the center, just above the working needles. This is a small trick I stumbled on that has eliminated hours of grief for both two-circ and flat production of side by side pieces. Securing the two pieces together in a fixed orientation helps me keep on track, knitting both items in the same direction and minimizing the “Drat! I just loaded everything onto the same needle” mistake. I have a question about that two-circ method. I’m trying it, and it appears that after you’ve finished knitting along one side of each sock, all the stitches are on one circular needle. Is that correct? And if so, why use two? You are correct. When knitting in the round you can put all the stitches on one circular. In “regular” circular knitting the circumference of the needle is a close match to the item being knit, and you work merrily along. For socks this would mean an exceptionally short circ – perhaps one about 12 in he’s long. 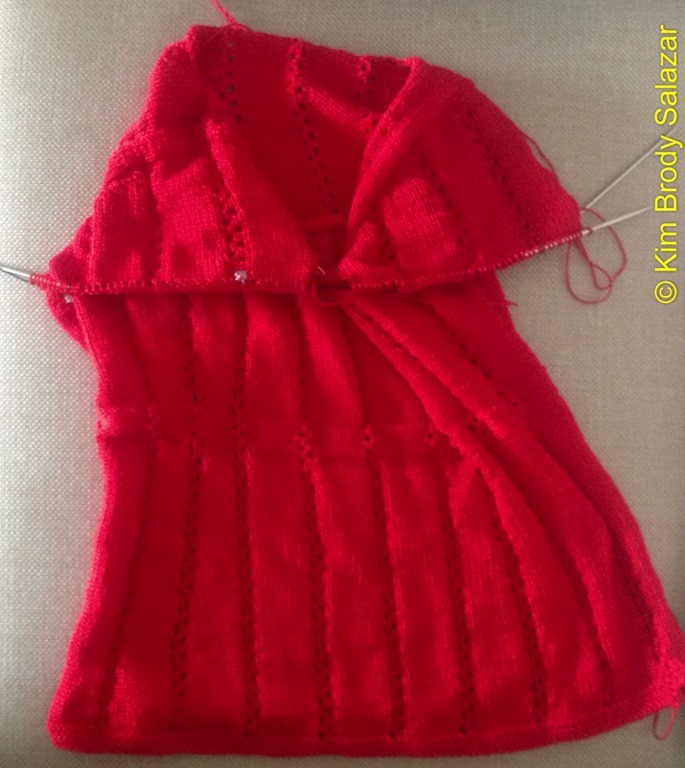 In “Magic Loop” knitting you use a circ that’s hugely longer than the circumference of the project, teasing out a big loop of cable about half way around the piece, then working up to that point. When you are there you tease out a new loop further on. Some people use a gigantic circ and two or even three excess cable length loops. In this case the circ for socks might be 36 inches long, especially if you are knitting two socks side by side at the same time. In “Two Circ” knitting you use two circular needles of any length. Each circ stays in place, and is used to work the same set of stitches over and over. It does not travel around the piece like a double point needle does (if you doubt this try knitting with one odd color DPN and you’ll see it walk around the piece). Advantages of regular – no fishing for needle ends. No in between needle spots where ladders of loose stitches may develop. Disadvantages – some folks find short circs uncomfortable because there is not much holding room and the needle part itself is often tiny. If you are knitting an object that changes diameter, like a sleeve, you will need to change length needles to accommodate. Advantages of Magic Loop – Any diameter piece can be knit. Two items can be knit side by side – socks or sleeves for example, so that both emerge the same length without fussing over row counts or measuring. Longer circs are more comfortable for some people to use (like me – my hands are very big). Disadvantages – fussing with the big loop can be an annoyance. Very long needles can be expensive. Possible ladder spots or visible stretch marks where the excess cable is looped out (mitigated by moving this point around). Occasional annoyance if a repeat bridges the loop out point. Advantages of Two Circ – any diameter piece can be knit. Two items can be knit side by side. Longer, more comfortable needles can be used. Any length circ can be pressed into service (no need to buy special extra long ones, especially if you have. Needle stash already). Disadvantages – fishing for needle ends (I minimize this by using two circs with different color cables if I have them). Possible ladder spots where the two circs meet. Occasional annoyance if a repeat bridges the spot between needles.